Forty eight hours after the alarm was raised, the Airbus A319 took off for Kuala Lumpur International Airport. I was on a race to get to the artifacts before they could be destroyed by acts of God. When the plane landed, I took the high-speed train to the rendezvous point where I was picked up in an unmarked car and driven to an undisclosed location. 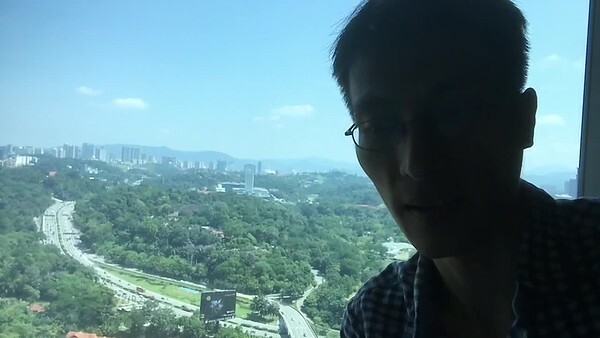 TV broadcast from the 28th floor of the Kuala Lumpur Hilton. Forged Japanese occupation overprints are abundant and have been extensively documented, but the implements that produced them have never been reported. On the 25th of April I received a message from a new acquaintance. He was looking for information on a bunch of strange chops that his late father had left behind. It turned out to be a large assortment that included seals, machine chops, bma and even postmarks. Multiples of some overprints incuding five of the Okugawa seal, which has three genuine forms. How old they are, who made them, who used them and quantities produced remain unconfirmed. Forged handstamps shown to the author, somewhere in the outskirts of Kuala Lumpur. The designs look as if they were etched out of zinc using a photographic mask and acid. 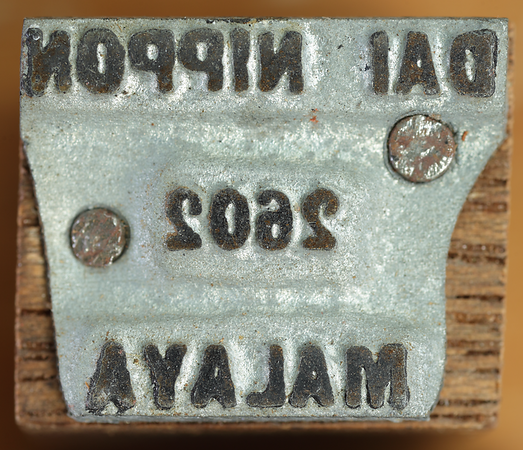 These so-called zinc linecuts were a common way of making handstamps at the time. 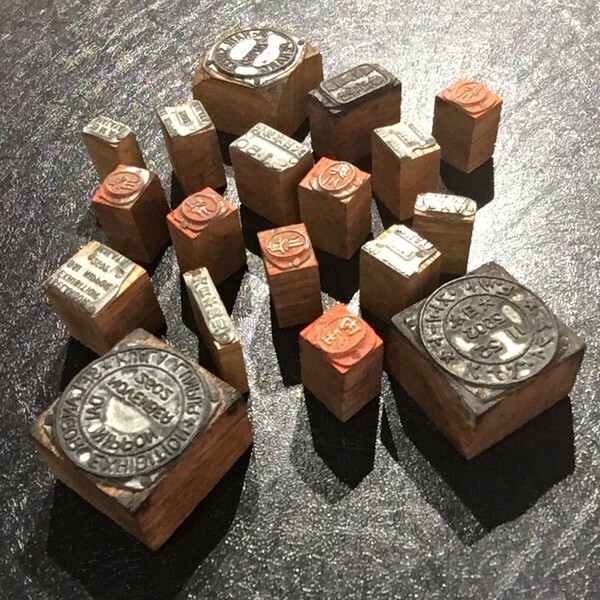 The dies were nailed to blocks of common furniture wood that served as grips. They were apparently cut from the same strip of wood and are of exactly the same height. 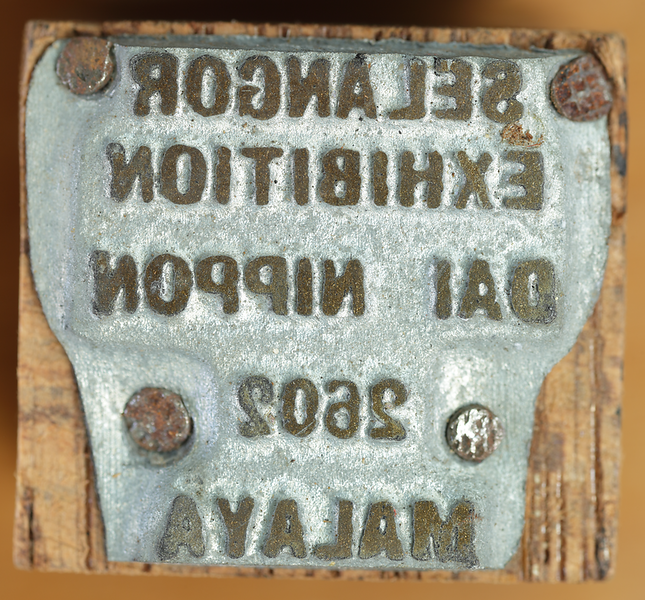 In fact, Chinese restauranteur and Sydney stamp dealer David Allan Gee, also known as George Gee, amassed the largest known collection of such forged handstamps. 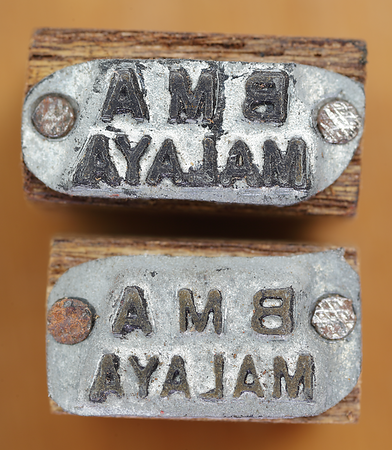 Police once raided his premises and found a biscuit tin containing some 250 zinc linecuts of forged overprints and surcharges (Tyler 1991), including bma malaya. All these types are represented in the Kuala Lumpur hoard, but it is not clear whether they came from Gee. Forged single-frame overprint caked with black residue apparently from faking the relatively rare black variety of the chop. The author examined several stamps (not shown) bearing impressions made by this chop, all with black ink. It is a forgery of Proud type 5 (Gallatly type E). The outside edge of the frame is too straight, the frame is too thin, and its corners are too rounded especially at upper left. The characters are suspiciously clean. 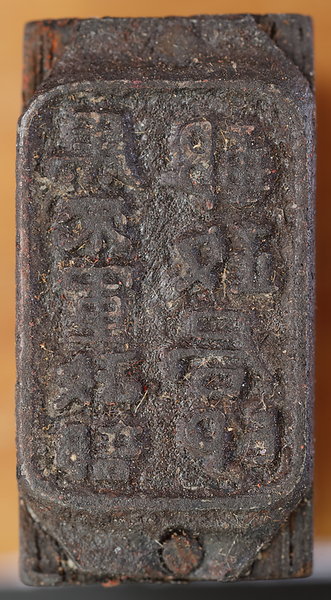 See two other forgeries of type E.
This forged Okugawa seal imitates the relatively elongate second form of the seal in overall look and feel, but the details do not conform. These imitate the third form of the Okugawa seal in overall look and feel, but the details do not conform. 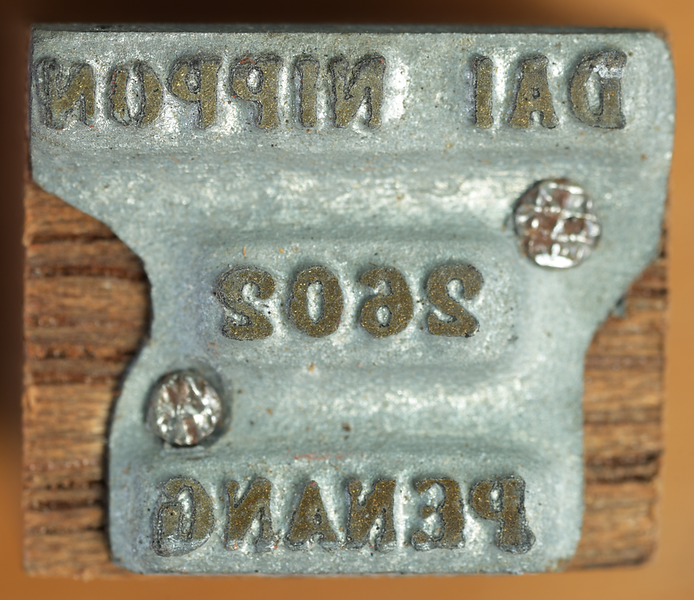 The details of the characters differ across the handstamps, which indicates that the handstamps were not produced from a single template. There is of course no point making multiple copies of exactly the same seal, since one piece should suffice. The intention may have been to introduce variability, which would make it more difficult to tell the forged overprints from real ones, and dilute suspicion. 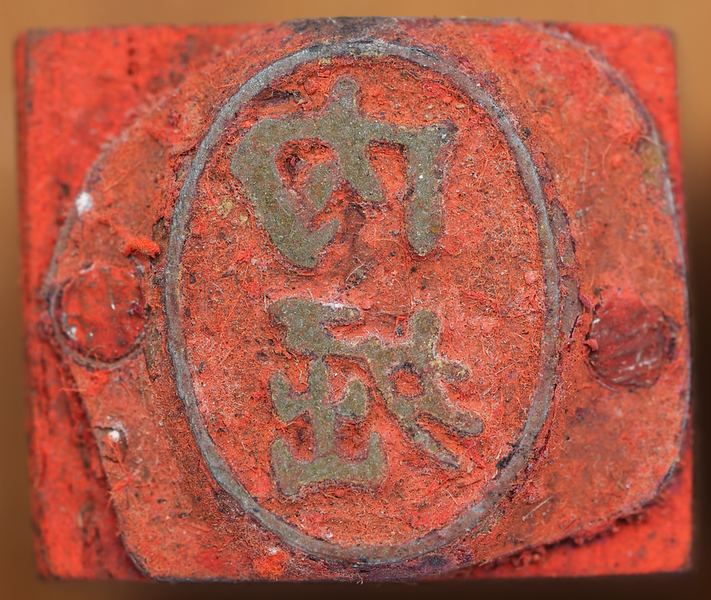 Forged Uchibori seal. 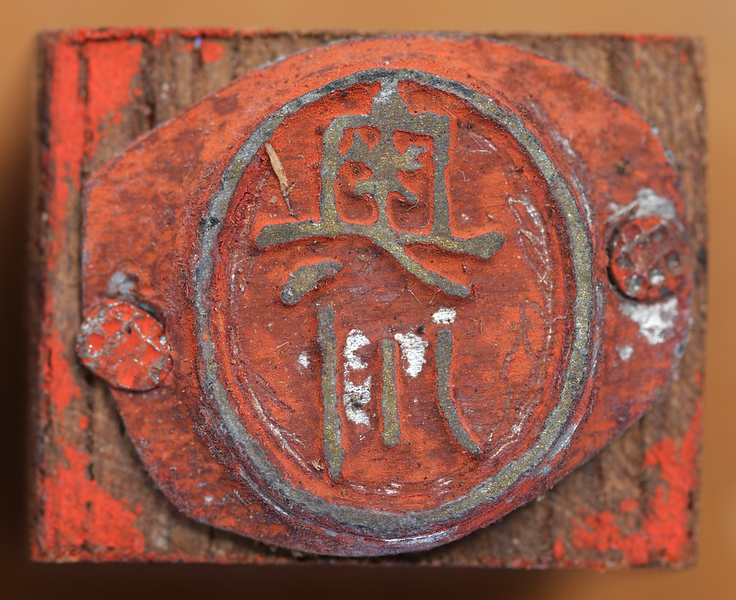 The Penang seals were probably inked on soft ink pads that smeared the whole surface. Forged Dai Nippon 2602 Penang machine chop with sloppy lettering and blunt corners. Forged Dai Nippon Malaya machine chop with sloppy lettering and blunt corners. Font weight differs between the two, indicating that some trial and error was going on. Forged Selangor Exhibition machine chop with sloppy lettering and blunt corners. Forged Kanji overprint. The serifs are indistinct and the strokes melt into one another. It was a good effort but it doesn't fool the sharp eye. In contrast to the forged seals, the forged machine chops look as if they’d seen very little use. Perhaps the forger had them made and then realised that they were not up to the job of replicating the precise lettering. 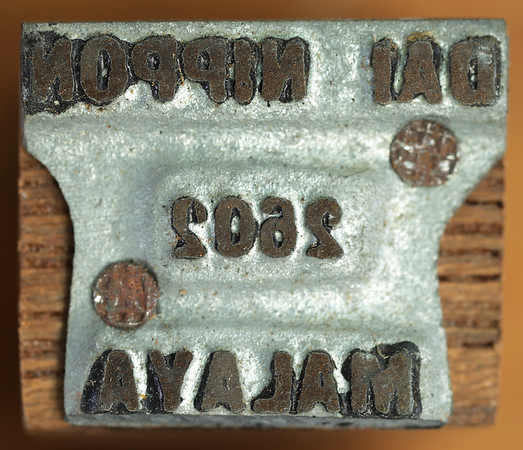 Forged BMA MALAYA overprint. See BMA overprint forgeries for details. How were these made? The alloy used in the type tends to be type metal, an alloy of lead, tin and antimony, but here some look like aluminium and some zinc with a slight greenish tinge. These are common materials used in die casting. 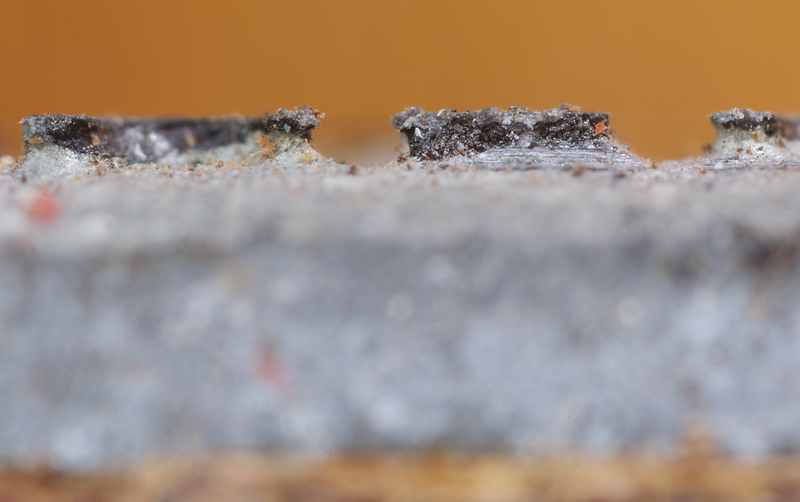 The Printing surface seems to have an additional plating of another metal or alloy to reduce wear. It has worn off in some places. Vertical definition of the printing surface. The typography may be sloppy, but the topography is incisive. I am grateful to the individual who tipped me off about these artifacts. His identity is kept confidential to protect his privacy.